This week it is the turn of the Upland Ranger team to write this blog. At this time of year we are working mostly in lower level countryside, rather than up in the fells, and in recent weeks much of our time has been spent on a project at Moss Eccles Tarn. This is a picturesque glacial mountain tarn which was enlarged by the construction of a small dam and is situated not far from the village of Near Sawrey. It is also reputed to have provided inspiration for "The Tale of Mr. Jeremy Fisher". Moss Eccles Tarn is a special place for wildlife today and is valued in particular for the wide range of aquatic and wetland plants and for its dragonflies and damselflies. It was bequeathed to the National Trust as part of Beatrix Potter's estate. The tarn is classed as a reservoir and as such falls within the scope of the 'Reservoirs Act 1975' which means that it is subject to regular inspections by an engineer. Following the most recent report, it was recommended that the dam be strengthened and the height raised. The work on the dam wall was completed by civil engineering contractors. Once this part was completed, work on the 'reinforcing revetment' behind the dam wall was required. This had to be raised to be consistent with the new height of the dam and strengthened with stone pitching to ensure that the dam is capable of being 'overtopped'. 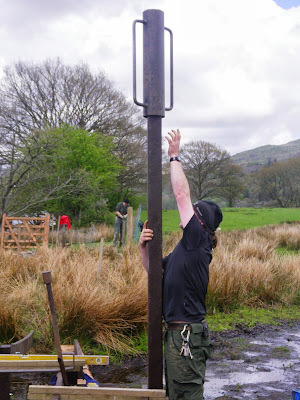 This was identified as a good project for the Upland Ranger team since stone pitching is a technique that we often use for upland footpath work. The first stage of our work involved digging out the old revetment behind the dam wall to a point where there were good foundations from which to start the new stone pitching. We also had to collect and transport several trailer loads of stone to the site for the pitching work. Our work behind the dam wall was divided into three sections, based on the shape of the dam wall, and our work was carried out on each one in turn. The stone pitching work carried out was very familiar territory for us. However, the specification for the work required that the part next to the dam also used concrete. This was very strange for us as we normally work purely with dry stone. In addition a geotextile fabric was used, along with soil and turf, to cover the top of the stone pitching work. This meant we buried our lovely stone-work - the "treasure" referred in the title for this blog. There wasn't sufficient turf available to cover all of the work done behind the dam wall and soil and grass seed were used for the remainder. It should start to green over early next spring and hopefully this time next year it will blend nicely in with the surrounding countryside, similar to the picture before work started above. Our last day on this project was at the start of this week and Sarah baked cakes to celebrate. Sarah created the "Moss Eccles" cake which instead of currants (which she doesn't like) has a filling of cranberries and white chocolate. Delicious! Moss Eccles Tarn has been a very picturesque location to work at, although we are very lucky since we get to work in beautiful locations almost every day. A woodland walk and some more seating. During last weekend two of my regular volunteers joined me to install another seat at the amphitheatre beside the Trust shop. We had intended to install two but we couldn’t manage to start up the large, self-loading, powered wheel barrow. These are pretty big chunks of wood to be man-handling so we only managed the one this time. However, there is now a bit more seating where there are fantastic views over Derwentwater. We’ve also had a few Rangers working on the path in Cockshott Wood so there is now an accessible path around the wood for wheelchair and pram users. The newest bits are looking a bit raw at present but in a few weeks they will have weathered in nicely. So there’s been quite a leap forward in that project and we hope many more people will now be able to enjoy much more of the area around the shop. One of the nice things about walking around this path is just enjoying being in a tunnel of trees with lots of dry leaves underfoot. It’s great fun for kids (big and little ones!) and dogs to charge around scattering them. 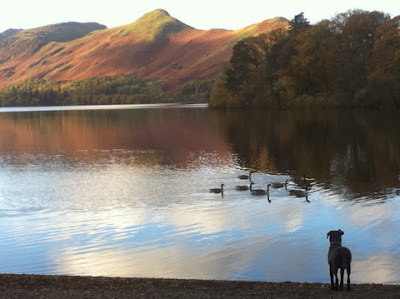 Roy says it’s too cold to go in the lake but I think it’s great – a little bit cold maybe. I sadly attended the funeral last week of Allan Alcock, a good friend from the Mountain Rescue team. He had been an active member of the team since 1968. Allan was one of the mainstays who was constantly sorting out the kit and the vehicles. He always had a friendly word and is going to be much missed. In last week’s post I mentioned wild camping on the high fells and how it can be a fantastic experience when it is done well. 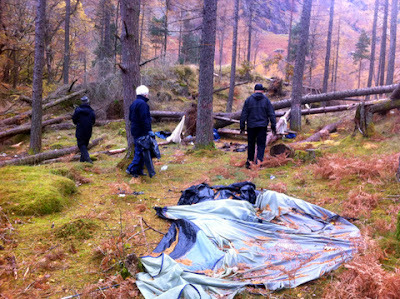 A good wild camp will leave behind no damage, no debris and no lasting sign that it ever happened. It is something that we encourage. Unfortunately that is not always what happens. Last weekend we had a joint working party with the National Park rangers and volunteers and one of the things we did was clear up the site shown in the pictures. Clearly a large group had decided to party in one of the woods in Borrowdale. They had cut down some small trees to have a fire. They left behind all their rubbish including bottles and had even smashed some of them. Why do that? 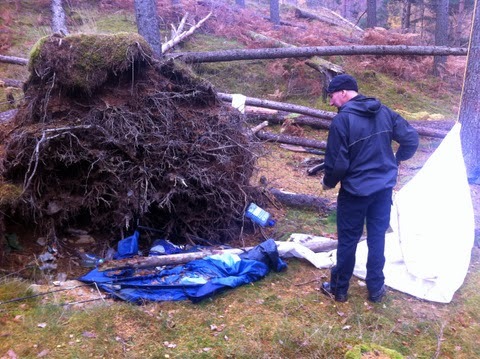 Thankfully the National Park rangers and volunteers joined me in clearing it all away to return the site to a safe and clean condition for others to enjoy. It puzzles me that people would make the effort to seek out a beautiful place and then spoil it. It is very easy to go and enjoy a beautiful part of the countryside without wrecking it. I’ve been for a job interview. I’m going to be a search dog. Well, I’ve got a lot of work to do first. There’s lots of training to do and there’s exams you have to pass but I reckon I’ll be great. My time Ranger Intern is nearly up, Along with Leila and Stu I’ll be finishing at Christmas, with the new batch of Interns starting sometime in the new year. I’ve had a great 8 months working alongside the South Lakes Ranger team, so for this weeks blog I thought I’d share with you some of my highlights. · The Blea Tarn Fence. Working with Sam and Stuart I helped on the fence that reaches out into Blea Tarn. A tricky spot to fence in as digging the posts in wasn’t possible due to Blea Tarns SSSI status. In the end we drilled holes into big boulders and rolled them into tarn. We inserted metal poles into the holes and secured them with resin. 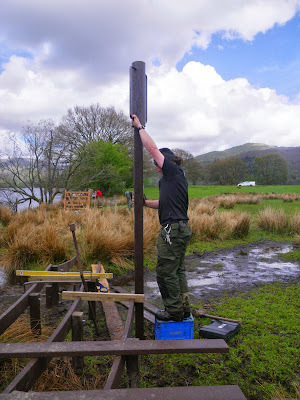 We attached posts to the metal poles and continued to post and rail as normal. An interesting day, at the end of which we all had wet feet. Stuart and Sam securing the posts and rocks. 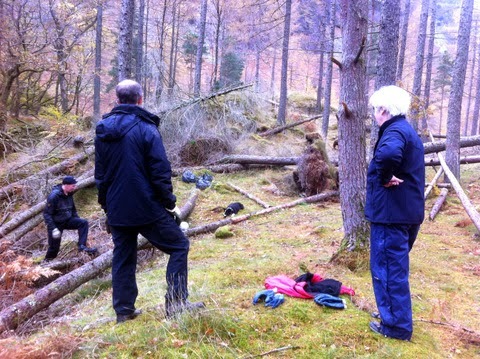 · Writing a Woodland Management Grant. 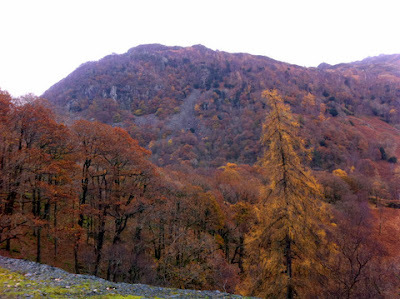 One of our Intern projects was writing a woodland management grant for the Colwith, Tilberthwaite and Little Langdale woodlands. This involved spending a few days walking around the woodland sites (brilliant days “work” for a tree hugger like myself!) looking at the species within and deciding how best to manage them, before trying to get our heads around the application form. Hugging the Veteran Scots Pine in the Woods Behind Blea Tarn. 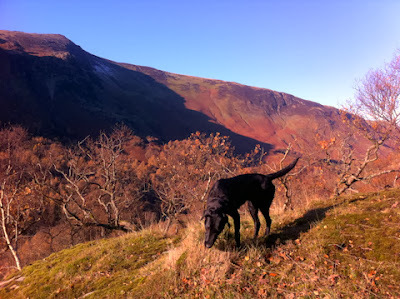 I spent 2 weeks with the Upland footpath team which I wrote about in an earlier blog. Despite the early starts and later finishes I enjoyed working with the team, learning how to pitch and landscape, and even started to enjoy the long walk to the top of the fells (mainly because I knew I could have a second breakfast when I got to the top). My Completed Section of Pitch on Fairfield. It was excellent experience to get to work with basecamp, and the varied volunteers who stay there. Working on the path from the Ferry to Hill Top was a couple of great days with enthusiastic volunteers who managed to get a huge amount of work done. The Ferry to Hill Top Path in Progress. · And a whole load of other jobs including building a style, surveying touch me not balsam for netted carpet moths, working with the South Lakes Conservation Group, strimming and the restoration of the Monk Coniston Cold Frames. Standing on my Completed Style. The Intern House and Commute to work. 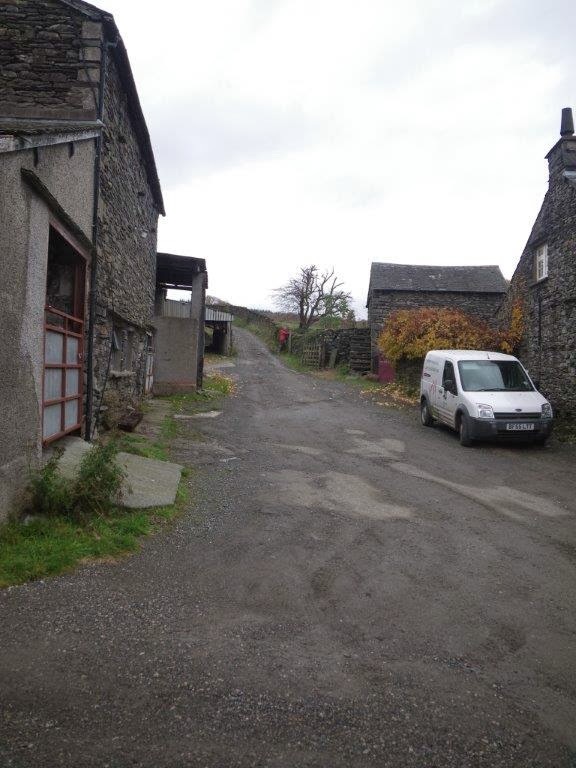 One of the great things about this Internship is that accommodation is provided at a house in Low Yewdale. Although there have been a few issues to sort in the beginning, it really has been an experience in itself living in what feels like the middle of nowhere. The kitchen window looks straight out onto one of Bob’s field, and during the summer it took a while to get used to the cows looking straight back at you! It is the perfect base for walking or sitting and watching the world go by. Our House at Low Yewdale. Our commute to work is probably the best commute I’ll ever have, a 15 minute walk along a track, hedgerows on either side, the fells behind you and Herdwick sheep looking at you as you pass by, it’s amazing we managed to make it into the office every day! I couldn’t write a reflective blog without mentioning Jed and Fin, Jed is Richard’s spaniel and Fin is Stuart’s fox terrier. A surprise to me when I first started is that sometimes, dogs come to work with their Rangers. While working with either Stuart or Richard I will admit to spending “some” of my day throwing sticks or playing tug of war. I will definitely miss incorporating fetch into my days work. The South Lakes Ranger Team. A big THANK YOU to all the Rangers for making us feel welcome, being patient, teaching us new skills, and not laughing too much when we (mainly me) asked silly questions. New Interns, You’ve a lot to look forward to! Last weekend saw me with friends from the Rescue Team making the trip to the summit of Great Gable to join others for Remembrance Sunday. There was quite a lot of snow underfoot and we walked up through cloud. Daisy came with us and she enjoyed herself running around in the snow. 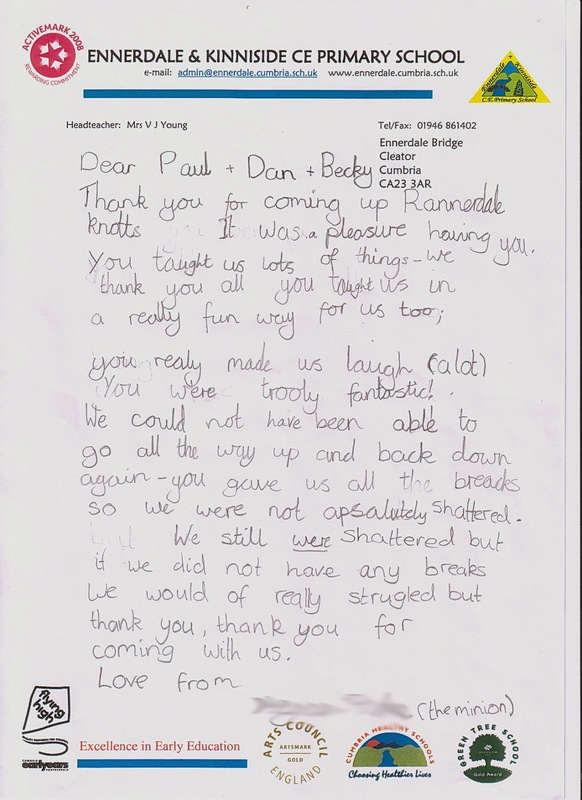 We noticed on the way down a group wild-camping at Styhead Tarn – a fantastic place to camp and done properly, they would leave no lasting impact on the site. By the time we were making our way down, the cloud had cleared so a couple of guys were able to paraglide back down to Seathwaite. What a great way to come off the hill although one of them said he was doing it for the benefit of his knees! During the week I worked with Jack and Joe on continuing to bring the Cockshott Wood footpath up to an access-for-all standard. 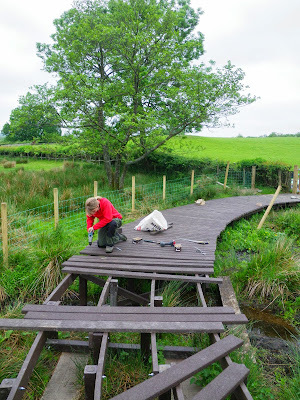 It will take some time to complete this but we hope eventually it will be possible for wheel-chair users to start at the Trust shop, visit Friars Crag then continue along the Lake shore circling back through Cockshott Wood. Or enjoy a quiet woodland walk around Cockshott. I also spent some time at Braithwaite Schoolworking with their Gardening Club. We have levelled an area of their grounds where they are going to make a wild flower meadow this Spring and Summer. We are planning to bring to the school a bale from one of our local farms that has good hay meadows so that we're not importing different genetic strains into the area. It's also a lot cheaper than buying commercial seed. I’ve been up Gable. I went up when I was little but Roy carried me last time. This time I went all the way on my own. It was great. Dry stone walls fall down all the time. 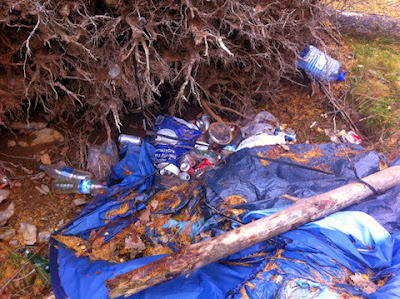 They can be knocked by livestock or falling trees, disturbed by moving vehicles or damaged by people leaning on them. These structures are often hundreds of years old; standing through many historical events and witnessing the lives of people we find inspirational today. When these walls fall down, it often falls to the rangers to get them built back up again so they can continue to serve their original purpose as boundaries, to maintain the iconic image of the Lake District and to keep this traditional skill alive. 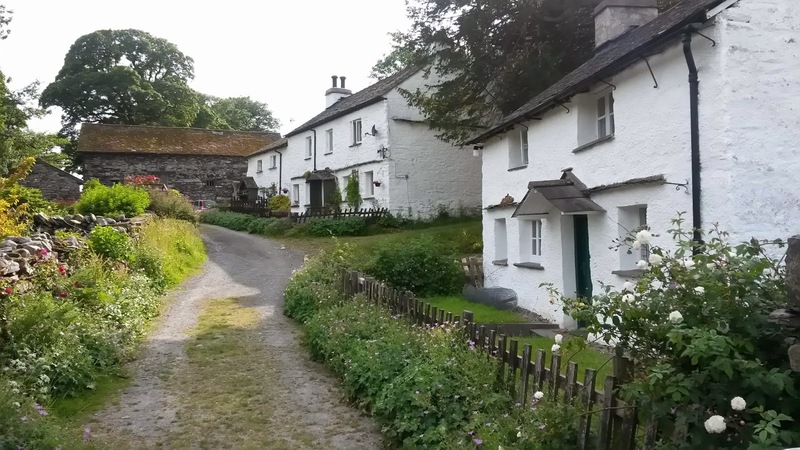 So it was with great excitement when the call came through to say a wall in Beatrix Potter’s back garden had come down and we were the team to be given the honour of rebuilding it. How often do you get called in to repair the scenery that appears in such a renowned children’s book? 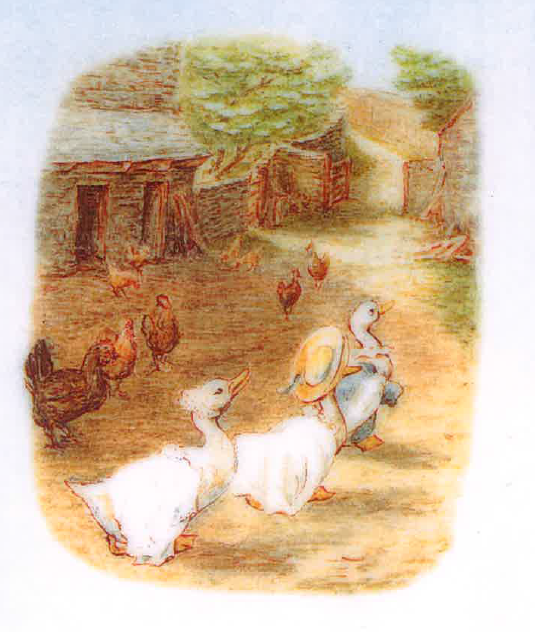 From The Tale of Tom Kitten by Beatrix Potter (Frederick Warne and Co, 1907). You can just about see the wall we were to rebuild heading up the lane in front of Jemima Puddleduck. In a later photo you can see the lane as it looks today. It turned out the job was going to take longer than expected, once we took down the wall to a structurally sound level the gap was almost 4 metres wide from an original gap of maybe 1 metre. This wall has probably stood since Beatrix Potter lived in Castle Cottage, if not before, only now succumbing to many years of people leaning on the wall to take photos of the home that she shared with William Heelis after their marriage. Adding the last of the cams on top of the completed section. The stretch without all the moss on it is the bit we rebuilt. This wall in particular fell down mostly through natural wear and tear. It was bowing in odd places, suffering the cumulative damage from hawthorn tree roots, users of the track, weathering and many freezing winters. 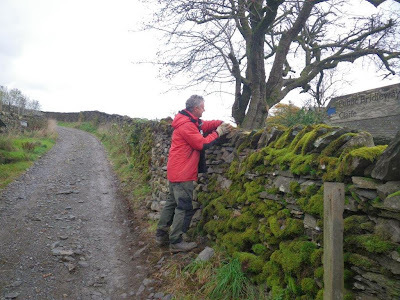 This wall is also taller than most of the dry stone walls in the South Lakes area. Beatrix was a very private lady. We speculated that she had the walls built so high to allow her to keep her privacy. Beatrix is said to have run out of a fire door she had built at the back of the cottage when she saw someone approaching the house she had no desire to speak to at that time. We were doing our bit to maintain the privacy for the residents living there today. We spent 3 full days there as a team of 3, rebuilding the wall and chatting to the many visitors to the area on their way for a jaunt up to Moss Eccles Tarn. 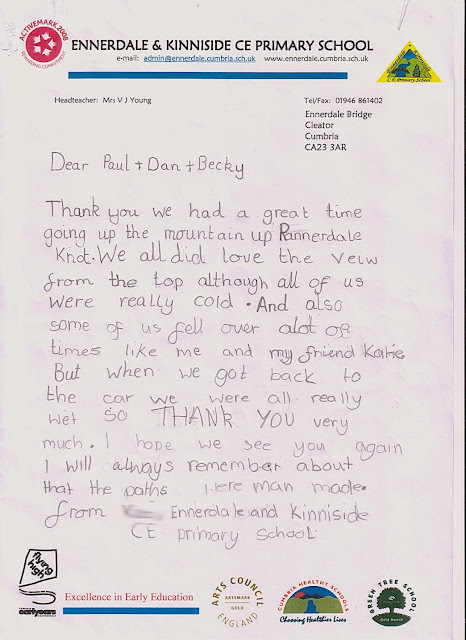 Many shared with us their stories from their visit to Hill Top and their reasons for visiting the area. Visitors come from all corners of the globe to enjoy the landscape that inspired the stories and work of this inspirational woman. I, for one, felt very proud to be rebuilding this piece of history and maintaining the view for future visitors to the area. A bonfire in a downpour. We’ve had some weather this last week including a sprinkling of snow on the tops which is fantastic to see. And of course it was the time for the bonfire celebrations. We had it on Crow Park which is next to Derwentwater. It is a beautiful place but, if the weather is bad, it is especially so there. It just drives in off the lake. But we just have to go ahead no matter what. So I was really pleased to see as many people turn up as did considering the weather. It came in waves with not very wet followed by very wet! But it was great to see the people who did come along to enjoy the bonfire. 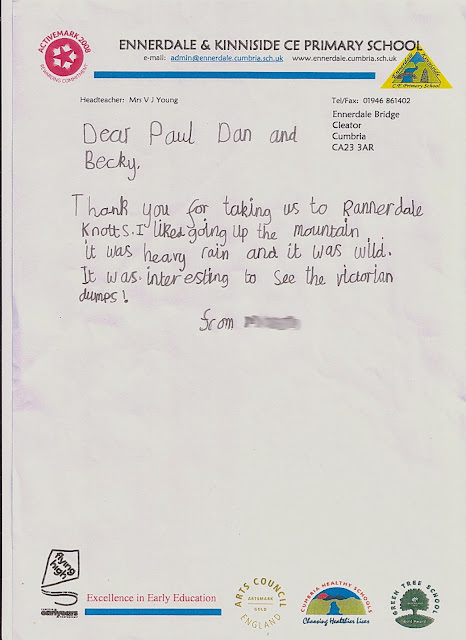 A lot of our events are weather dependent but you just have to go ahead no matter what. What happens of course is that the people who do turn up despite the weather intend to enjoy themselves so they do. Those who came all seemed to have a good time. The kids loved seeing a big fire with all the sparks flying. Weather wasn't so good on the clean-up day either! Che’s been to stay and it was great. He said it was OK if we slept on the settee. Roy didn’t seem to think so. How much can be achieved in two days? 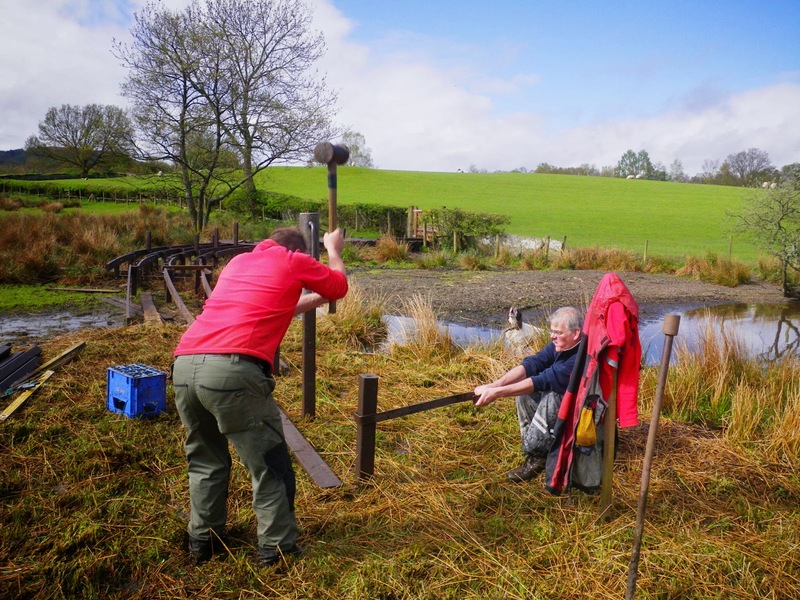 Well, if you have a big gang of hard working and willing volunteers – quite a lot! Shardale are a residential rehabilitation centre for people recovering from alcohol abuse problems. Staying at High Wray Basecamp volunteer centre for a week they helped us to refresh two sections of the path that runs from near where the ferry comes across from Bowness to Hilltop, the home of Beatrix Potter. It’s a popular path and is the main access route used by visitors to Hilltop who come on foot, but over the years had become quite overgrown and narrow. So, as part of the Windermere Reflections project we were digging back the edges and laying a fresh coating of gravel to return the path to it’s original width and glory. ... and the Ferry Hill path. And what a difference this has made! We were really impressed with the dedication, organisation and determination of Shardale and are very pleased with the progress on the path. It wasn't an easy job either - the digging out of the sides was difficult and generated an awful lot of turf and mud that then needed transporting to a position where we could load it onto a trailer and take it away. Then there was loading the various barrows with the gravel and getting that to the path to lay it down. Lots of walking, digging and lifting but despite many of the group finding the work quite tough everyone pulled their weight and carried on working right up until the last minute, a great effort. Feel the burn! One of many barrow loads of turf moved up the hill. Loading the trailer with turf and mud. It was a pleasure working with everyone and while we haven’t quite got the whole path finished the vast majority of it is done. More importantly, it’s done to a good standard so the next volunteer group we work on it with will have a good example of what we’re aiming for …. So if you’re in the area, or taking a walk to Hilltop yourself be sure to look down at the path under your feet. Sometimes it’s easy to take them for granted, but spare a thought for all the hard work that has gone into making both your and many other walkers’ progress that little bit easier! 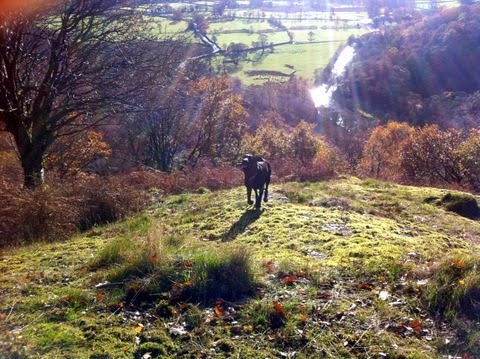 Since finishing our upland path work for the year we've recently been working again at Allan Bank in Grasmere. We've done a lot of work there over the previous two winters creating a trail through the woodland, but there's always a few more jobs to do to keep on top of things. Our first job was to build some stone drains. With a gravel path there's always a risk that during heavy downpours the path could be destroyed, so to stay one step ahead we've built a series of drains to divert the rainwater away from the path. Once we'd finished our drainage work we moved on to some path building. Using the same technique as previous years, we edged the path with logs, leading up to one of the view points. With all the logs in place it was time to start gravelling. Once all the gravel was put down we finished it off with the whacker-plate which compacts the surface making the path more durable. The photograph below shows a section of path that we were working on in February, we're putting in some drains before starting resurfacing. You can see just how wet and rough the original path was. The next photo shows what the path looks like now, and the drains certainly seem to have done their job. We're really pleased with the results, but don't just take our word for it, next time you're in Grasmere and you've got a spare hour why not pop into Allan Bank and have a walk around the woods? While working in the woodland we were also having daily sightings of Red Squirrels, so if you've always wanted to see one but not had the fortune, Allan Bank is certainly worth a visit. It seems a long time since the good weather of spring and summer now that the rainy season is really upon us. 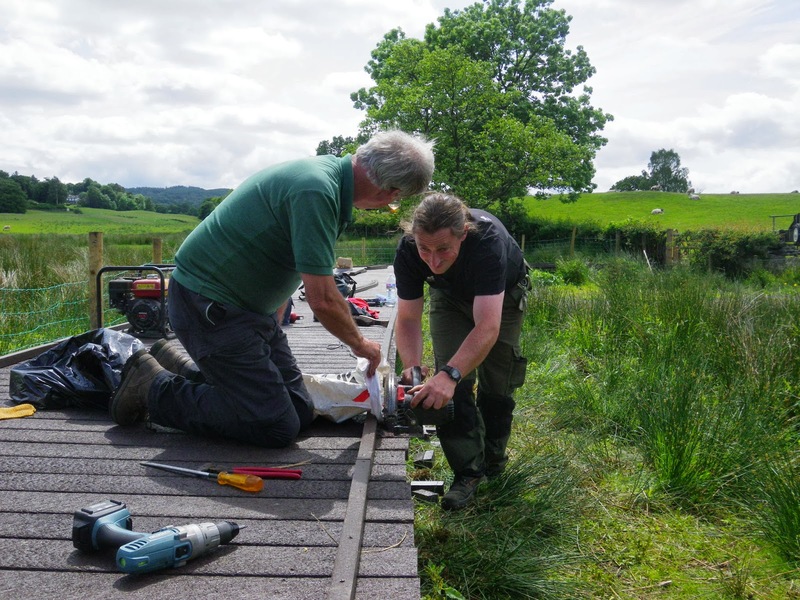 In spring I spent a fair amount of time helping to build a new boardwalk along the shore of Windermere to link the Trusts campsite at Low Wray with Wray Castle and the newly upgraded Windermere lakeshore bridleway. After so much recent rain it seemed like a good time to look back on the project. Finished boardwalk keeping everyone's feet dry. We used 3.5 tons of recycled plastic to make the boardwalk. We used plastic because it won't rot or get too slippery. There are more than 140 posts, some 3m long hammered (by hand) into the ground to build the deck on. If you added all the posts together that's more than 250m of post hammered in! It took about 30 days to build with volunteers and interns helping us rangers. Stand on a milk crate! Craig hammering with John holding the post square. We used a lot of posts in the ground partly to stop the boardwalk sinking in and partly to stop it floating off when the lake water rises in the winter. A shiny new (at the time) intern fixing the deck down. One disadvantage of using the plastic meant that whenever we cut pieces or drilled them we had to collect all the swarf to stop it falling into the lake. Trimming the planks to length and catching the waste in a bag.